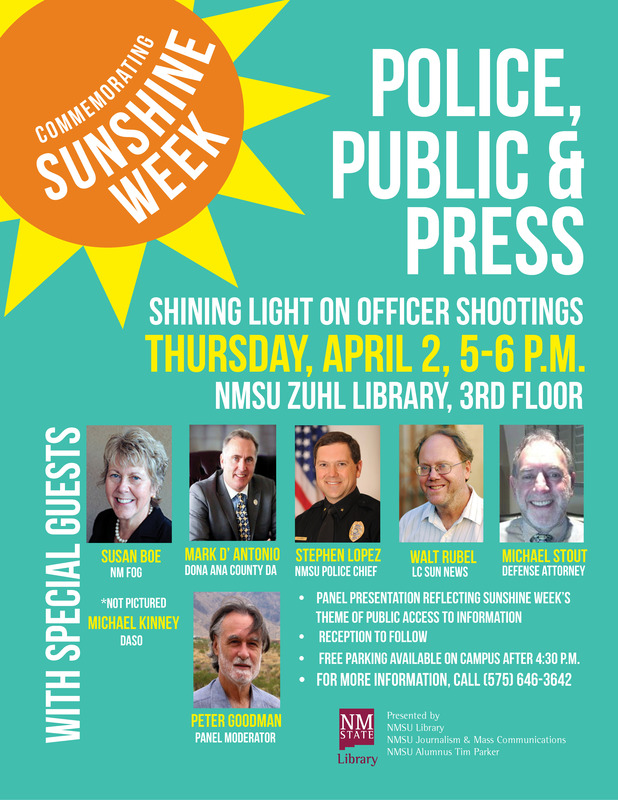 The NMSU Library, NMSU Department of Journalism & Mass Communications, and NMSU Alumnus Tim Parker are presenting “Police, Public and Press: Shining Light on Officer Shootings.” The event, held on Thursday, April 2, 2015, will commemorate Sunshine Week, which celebrates the public’s access to information, open records, and open government. It will begin at 5 p.m. on the 3rd floor of Zuhl Library on the NMSU campus. The panel will be moderated by writer, photographer, and lawyer Peter Goodman. With representation from open government advocates, the press, law enforcement, and the legal system, the panel will offer a lively yet balanced and constructive discussion of perspectives. The audience is welcome to participate with questions and a reception with the panelists will follow the event. Free parking will be available on the NMSU campus after 4:30 p.m. For questions or further information, please contact Reference and Research Service Librarian and Sunshine Week Program chair Paula Johnson at paulacj@nmsu.edu or (575) 646-7251.